So we have to make a distinction. If the Fed launches a fresh policy of extraordinary easing in the next downturn, the appropriate response will depend on whether market internals indicate that investors are inclined toward speculation, or whether they are inclined toward risk aversion. The central consideration here is what I call ‘uniformity’ – when investors are inclined to speculate, they tend to be indiscriminate about it. It’s difficult to get extended market advances without recruiting that kind of uniformity, but it will be important to avoid being sucked into the market in response to Fed easing alone. Historically, initial Fed rate cuts in response to a market downturn have been followed by very negative consequences (after the initial obligatory market pop), because they generally indicate that something has gone wrong. Last week, the Federal Reserve issued policy statements intended to telegraph a shift toward easier, or at least more patient monetary policy. Though Wall Street interpreted this shift as a major about-face in the Fed’s policy stance, the most significant shift in Fed Chair Jerome Powell’s statements actually occurred on November 28. Even here, we would characterize the Fed’s policy stance as neutral with a slight hiking bias, but investors should not imagine that a shift to outright easing by the Fed would necessarily be favorable for stocks. That “bottom of the range” view strongly aligns with our own. It’s important to recognize that what we call “structural” real GDP growth (labor force growth + trend productivity) has declined persistently in recent decades, to a level that’s now down to just 1.4% annually. All additional real GDP growth in recent years has been driven by a decline in the rate of unemployment from 10% in 2009 to the current level of just 4%. With a far smaller reservoir of “cyclical” economic slack, it’s likely that real GDP growth will slow toward that 1.4% structural rate. Any material increase in the unemployment rate would go hand-in-hand with a recession, and an outright contraction in real GDP. As I noted in my November comment, during the relatively low-inflation period since the 1980’s, Treasury bill yields have typically stood 0.5% to 1% above real GDP growth, but slightly below nominal GDP growth. Even if one assumes that stronger productivity will push structural real GDP growth toward 2% annually, a neutral Treasury bill yield would reasonably fall in the area of 2.5-3.0%. Without a further decline in unemployment, an acceleration in productivity, or higher inflation pressures, 1.4% structural real GDP growth would put our range for “neutral” at just 1.9-2.4%. In either case, as Powell observed, short-term interest rates are already within that pocket. That said, I certainly don’t believe that adjustments in Fed policy have very strong or reliable effects on economic outcomes, nor apparently does Powell. That’s one of the reasons I respect him more than his predecessors. He’s well aware of how loose the relationships are between Fed policy and actual economic outcomes, so he’s likely to encourage reasoned and deliberate actions rather than dogmatic and deranged experiments. He is, however, surrounded by activists, so that will be a challenge. With regard to longer-term bonds, during the relatively low-inflation period since the 1980’s, 10-year Treasury bond yields have typically averaged about 2% to 2.5% above the rate of real GDP growth, with yields roughly equal to nominal GDP growth. In that context, a 1.4% structural real GDP growth rate coupled with 2% inflation would put the “neutral” range for 10-year Treasury yields between 3.4-3.9%. That’s clearly above the prevailing yield of just 2.6%. In my view, current long-term rates only make sense in the context of still-aggressive monetary policy abroad, coupled with subdued expectations for U.S. growth and inflation. There may be further room for yields to fall in a recession scenario, but we don’t associate bonds with a strong expected return/risk profile here. I certainly don’t believe that adjustments in Fed policy have very strong or reliable effects on economic outcomes, nor apparently does Powell. This brings us to last week’s Fed policy statement. Though my impression is that the financial markets were rather over-eager in their interpretation of the Fed’s stance last week, it’s probably a distinction without a difference. As a practical matter, further Fed rate hikes appear unlikely without a surprising tightening of labor market conditions or increasing inflation pressures. So again, in contrast to Wall Street’s interpretation that Wednesday’s statement by the Fed represented a massive policy change, the actual shift, to the extent there was one, occurred back in November. Remember that while valuations are the main determinant of long-term investment returns, market outcomes over shorter segments of the market cycle are heavily dependent on whether investors are inclined toward speculation or risk-aversion. That inclination is wholly psychological. We read that psychology out of the behavior of market internals, because when investors are inclined to speculate, they tend to be indiscriminate about it. As I’ve demonstrated previously, even a shift to Fed easing typically has no benefit for stocks, aside from a short-lived knee-jerk reaction, unless market internals indicate that investors are inclined toward speculation. The entire total return of the S&P 500 since the 2007 market peak, and also since the 2000 market peak, has occurred during periods when our measures of market internals were uniformly favorable, while nearly all of the market collapses in 2000-2002 and 2007-2009, as well as the market weakness of recent months, occurred when internals were ragged and divergent. So while Fed easing clearly amplifies speculation when investors are inclined to speculate, it has very little effect in periods when investors are inclined toward risk-aversion. The chart below, from Bubbles and Hot Potatoes, offers a sense of this distinction. Here, I’ve defined “easing” as periods where the most recent move in the Federal Funds rate or the Discount Rate was downward, or where Treasury bill yields decline by at least 0.50% from their high of the previous 6-month period. The opposite criteria are used for tightening. This classifies about 63% of periods as easing, and 37% as tightening. 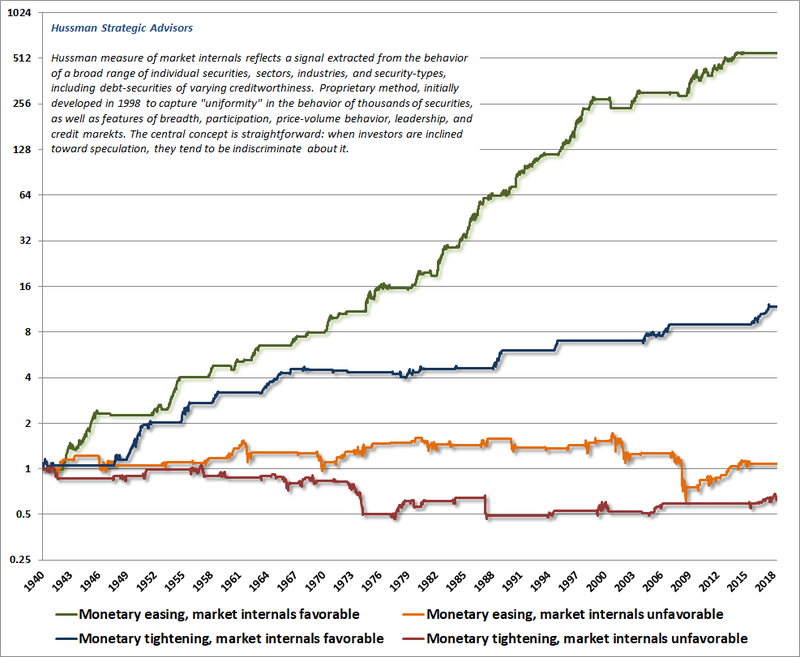 The monetary policy stance is then partitioned based whether the condition of market internals (our proxy for whether investors are inclined toward speculation or risk-aversion) was favorable or unfavorable. This is one of the key lessons that investors are likely to learn over the completion of this cycle, even though they should already remember that the Fed eased persistently and aggressively throughout the entire 2000-2002 and 2007-2009 market collapses, to no avail. For that reason, it will be important to take our cues directly from market action, not from Federal Reserve actions per se. Even a shift to Fed easing typically has no benefit for stocks, aside from a short-lived knee-jerk reaction, unless market internals indicate that investors are inclined toward speculation. The entire total return of the S&P 500 since the 2007 market peak, and certainly since the 2000 market peak, has occurred during periods when our measures of market internals were uniformly favorable, while nearly all of the market collapses in 2000-2002 and 2007-2009, as well as the market weakness of recent months, occurred when internals were ragged and divergent. “Investors haven’t learned their lesson. Despite the brutalization of New Economy stocks over the past year, ignorance and greed obey no master. Following the Fed move, investors went straight for the glamour tech stocks, dumping utilities, pharmaceuticals, consumer staples, hospital stocks, insurance stocks – anything that smacked of safety or value. Investors are behaving like an ex-con, whose first impulse after getting out of the joint is to knock over the nearest liquor store. “As anticipated, the Fed initiated a large ‘intermeeting cut’ on Tuesday morning, which allowed the stock market to dodge a bullet. Unfortunately, my impression is that the bear is toting a semi-automatic with a full clip of ammo. “My continued concern is that numerous market plunges have been indifferent to both interest rate trends and even valuations, with the main warning flag being deterioration in the quality of market internals, as we observe at present. Both in the U.S. and internationally, ‘singular events’ tend to occur well after internal market action has turned unfavorable, and prices are well off their highs. As I noted two weeks ago, the expected “clearing rally” from the December lows has served its function, eliminating the oversold condition of the market, and reviving bullish sentiment among investors. As of Friday, February 1st, the “clearing rally” from the December lows has brought the S&P 500 within 8% of the most extreme point of overvaluation in U.S. history; with valuations that continue to rival the 2000 and 1929 peaks, on the measures that we find best correlated with actual subsequent S&P 500 total returns. Meanwhile, our measures of market internals remain unfavorable. It’s that combination of extreme valuations and unfavorable market internals that continues to create a potential “trap door” situation for the market, and an environment that’s permissive of steep losses. As I did in late-December when discussing the prospect of a sharp clearing rally, I use the word “permissive” to emphasize the fact that we are not trying to forecast market outcomes, but are instead attempting to identify conditions in which various outcomes may be more or less likely to occur. That distinction is important. We always have to allow for potential shifts in market internals, and the combination of a retreating Fed, continued job growth, and the prospect of various “deals” on the budget and trade provides food for “Goldilocks” narratives that might encourage speculators to take that bit in their teeth. As much as I expect the S&P 500 to lose about 50-60% of its value over the completion of this market cycle, most likely over the next couple of years, I have no pointed forecast regarding shorter-term outcomes. The ‘clearing rally’ from the December lows has brought the S&P 500 within 8% of the most extreme point of overvaluation in U.S. history; with valuations that continue to rival the 2000 and 1929 peaks, on the measures that we find best correlated with actual subsequent S&P 500 total returns. Meanwhile, our measures of market internals remain unfavorable. 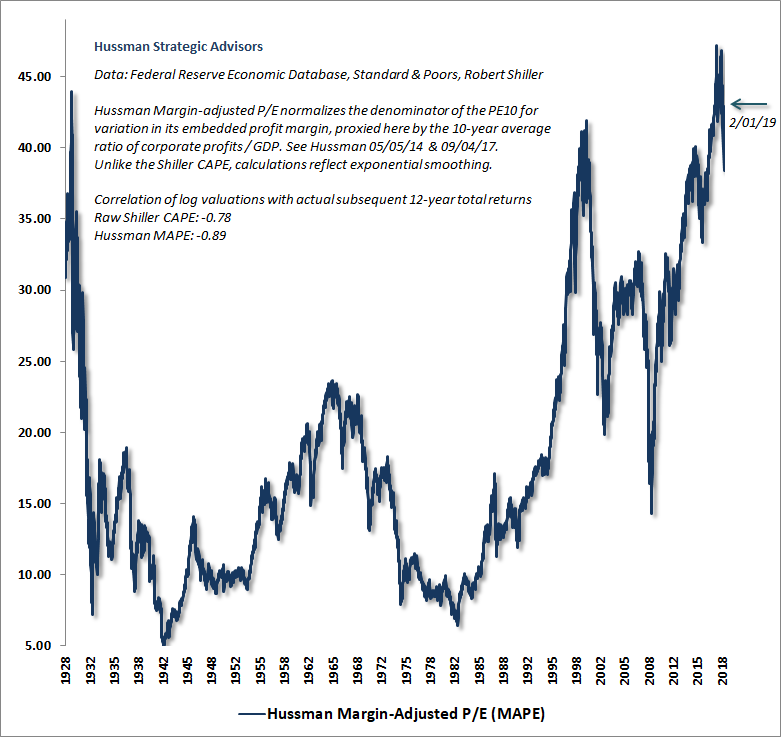 It’s that combination of extreme valuations and unfavorable market internals that continues to create a potential “trap door” situation for the market, and an environment that’s permissive of steep losses. The most recent shift in our measures of internals was the deterioration I noted on February 2, 2018, fully a year ago. Shifts in our measures of internals persist about 30 weeks on average, but with a wide range of variation. 25% of shifts have persisted longer than 40 weeks, and about 25% of shifts have persisted 7 weeks or less. A few favorable periods have survived beyond 80 weeks, and a handful have been single-week whipsaws. We view the uniformity and divergence across market internals as an indication of speculative or risk-averse psychology among investors, and we shouldn’t be surprised to see a few periods of speculation even over the course of what’s likely to be a steep and extended bear market decline. If internals were to improve with valuations as extreme as we currently observe, the most aggressive response I’d expect would be to encourage a constructive outlook with a tight safety net. But the more reasonable valuations become, the more latitude there will be to adopt an aggressively bullish outlook in response to improved internals. If internals were to improve with valuations as extreme as we currently observe, the most aggressive response I’d expect would be to encourage a constructive outlook with a tight safety net. The more reasonable valuations become, the more latitude there will be to adopt an aggressively bullish outlook in response to improved internals. As for recession risk, my impression is that risks are increasing more than Wall Street generally concedes, but we still don’t observe enough deterioration to conclude that a recession is imminent. My October comment, The Music Fades Out, included a discussion of our Recession Warning Composite. Presently, our recession concerns would increase greatly if the remaining components of that composite were to shift, including a decline in the ISM Purchasing Managers Index below 50, an increase in the rate of unemployment above 4% (barring another government shutdown that might otherwise bias it higher), and a slowing in the growth rate of nonfarm payrolls below about 1.4% year-over-year. Once we observe those factors, confirming evidence would include a decline in aggregate hours worked versus 3-months earlier. A steep drop in consumer confidence, particularly about 20 points below its 12-month average, would further raise our expectations of a recession. 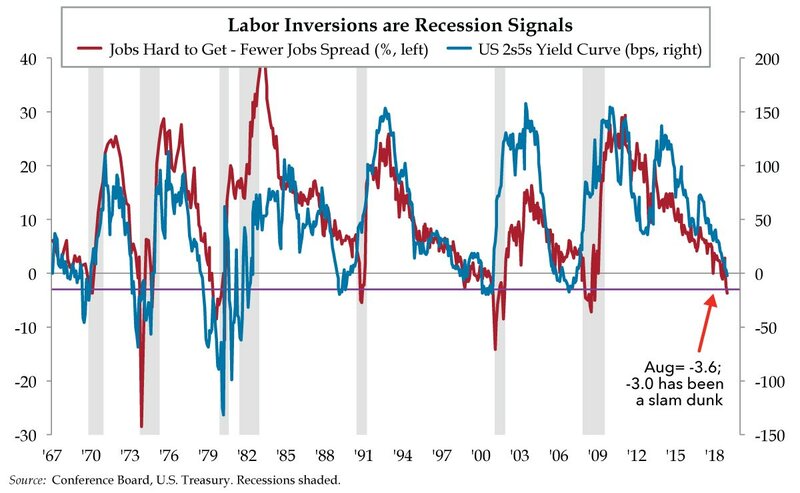 For now, we’re seeing certain inversions that tend to precede economic weakness, but don’t have immediate timing associated with them. 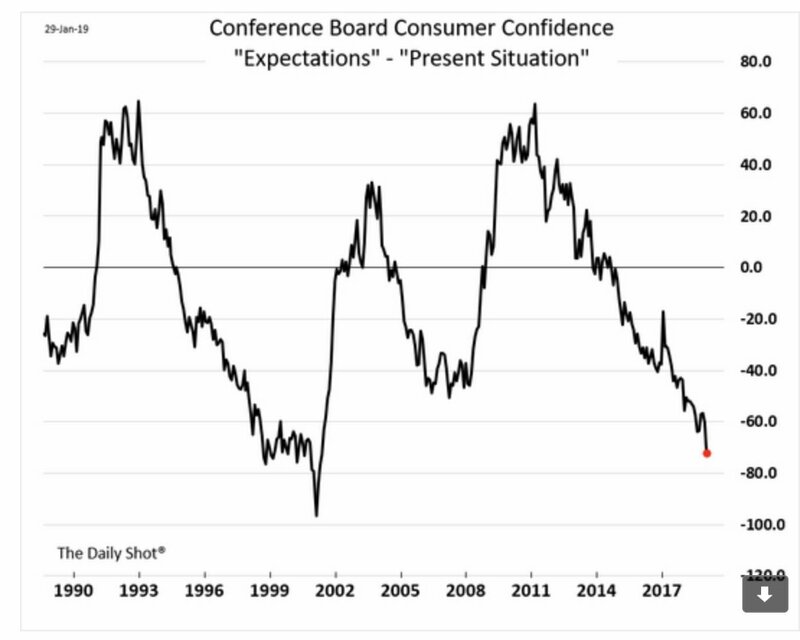 For example, as I noted last month, the “future expectations” component of consumer confidence continues to deteriorate relative to the “present situation” component. Other observers have also echoed this concern. This chart is from The Daily Shot. We also observe what my friend Danielle DiMartino Booth calls a “labor market inversion” in the jobs components of the Conference Board measures. Again, my inclination is to wait for more decisive evidence from all components of our Recession Warning Composite, but this remains a very late-stage economic expansion, and it’s appropriate to monitor conditions closely for recession risk. Our recession concerns would increase greatly if the remaining components of our Recession Warning Composite were to shift, including a decline in the ISM Purchasing Managers Index below 50, an increase in the rate of unemployment above 4% (barring another government shutdown that might otherwise bias it higher), and a slowing in the growth rate of nonfarm payrolls below about 1.4% year-over-year. A central feature of the recent experience with quantitative easing (QE) is that even as the Federal Reserve bought up Treasury bonds from the public and replaced them with $4 trillion in base money (currency and bank reserves), the swap did not provoke investors to lose confidence in the long-term purchasing power of the dollar. So rather than driving the rate of inflation higher, investors responded by treating the zero-interest base money as a pile of hot potatoes, which each successive holder could disown only by trading it for some risky security. Hence, QE helped to amplify speculation rather than inflation. Looking at Wall Street’s emerging dialogue, including questions we’ve received about the subject, it’s clear that some market participants and even politicians are beginning to imagine that this kind of behavior can be expected regardless of the quantity of money involved, and regardless of economic conditions. The idea, which runs contrary to centuries of economic evidence, is that any amount of money creation will be passively accepted by investors without a loss of confidence. On that assumption, the argument follows that any amount of economic activity can be generated simply by printing enough pieces of paper. If you think about how money is valued, it’s clear that people accept it because they believe it will provide a claim on the future output of others. Of course, that expectation requires that future producers will also give away their output and accept the money, on the belief that yet other future producers will do the same. That expectation has to continue indefinitely. Like the question “What holds up Atlas when Atlas holds up the world?” it’s not enough to answer that he’s standing on a turtle. It’s got to be turtles all the way down. The value of money has an enormous psychological component, and if that psychological confidence breaks, the result is inflation or hyperinflation (particularly when disruptions in the supply of goods are also involved).